The Objective: The Comet was the objective for the game. At the start of the third battle round, the players roll off. The winner divides the table in four equal quarters, and assigns a unique number from 1-4 to each quarter. The winner then rolls a dice and places an objective marker as close as possible to the center of the table quarter with the number that matches the result rolled. The player than controls the objective marker at the end of the fifth battle round wins the battle. And due to the Twist, Field of Glory was also selected! Place one objective marker at the center of the battlefield before rolling off; starting with the winner of the roll-off, each player sets up one objective marker in their deployment zone, more than 6” from any table edge. At the the of the fifth battle round, the player that controls the most objective markers wins the battlefield. A player wins immediately if they control all three objective markers at the end of their turn. The Twist: Many Paths to Victory was drawn. Generate an extra Objective. Both objectives are used for this battle. If the players achieve one of the objectives each, then the battle is a tie. Be sure to distinguish each objective markers belong to which Objective. The Ruse: Dug In! for the Death Guard. Any of your units that are not in cover at the start of the first round count as being in cover as long at they remain stationary (they have not moved from where they first deployed). Using the Open War cards, the Modified Dawn of War (long edges) map was selected. We have more photos available to view on Google Photos. Jason was the first to deploy and the mischievous Nurglings deployed right on the objective in Max’s deployment zone! Then followed up by placing a unit on the middle objective as well. For his third placement, he placed the Renegade Knight on the objective in his deployment. Max would have to come up big with a seize the initiative or else the game was over before it started . . .
Max’s roll to seize failed, but he used his Painted Reroll (house rule) and rolled a successful 6 to seize!!! Jason then called upon his Painted Reroll to make Max re-roll that success but he was successful again! He really wanted to seize. First up for Max: Kill the Nurglings! 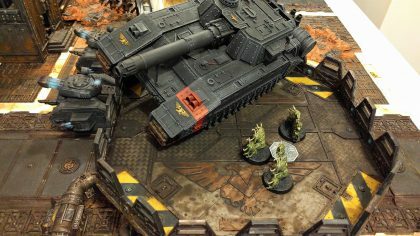 The ones on the middle objective were easily taken down by a group of Leman Russ’s but the ones next to the Shadowsword proved too mischievous to want to die . 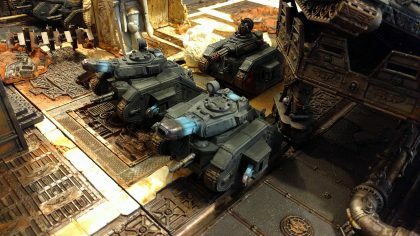 . . until the Shadowsword ran them over with its tracks. The Valkyries flew around the board, harassing a lot of units but also brought down the Death Guard Knight. The Grav equipped Leviathan assaulted Leman Russ after Leman Russ, drilling holes into them with it’s drill arm. 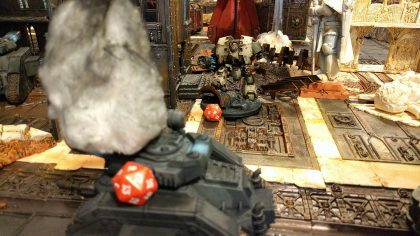 The Militarum were none to pleased with this and the Shadowsword unleashed its Volcano Cannon, annihilating one of the Leviathans. The Comet came in Turn and landed in the center of the board. A new objective for both forces to try and claim. The Drill enabled Leviathan walked up and chewed right through Pask’s tank on his way to crunch more metal. 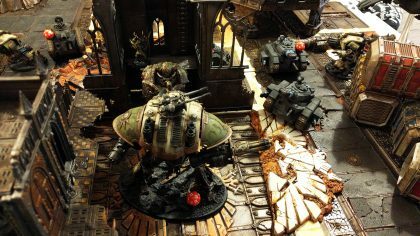 The Shadowsword wasn’t done destroying Death Guard units with its Volcano Cannon, unleashing it and popping the Greater Blight Drone to a pile of ick in a single shot. 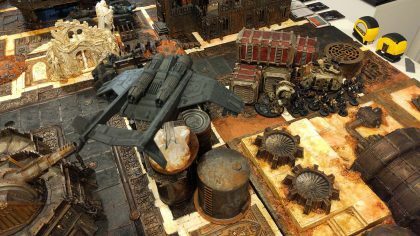 With the Drone destroyed, the Militarum was able to control all three objectives! 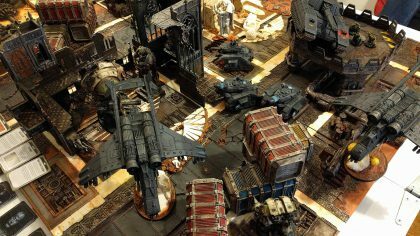 After taking out the Greater Blight Drone, the Valkyries were able to fly into and secure the last objective (and the comet!) 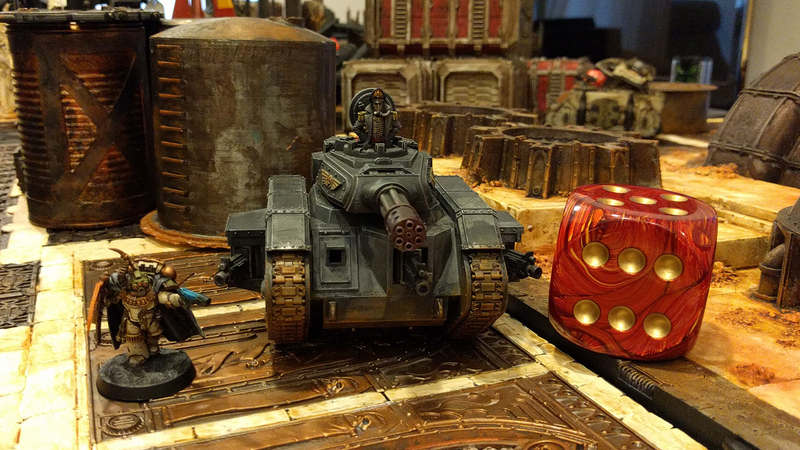 for an Astra Militarum victory! Next Next post: What we’ve been up to?